Things to know. Tips for success. Surface Prep. A term used often among painters is “make ready ”. The process of any professional paint job starts with the preparation. If it be inside or out, all surfaces must be prepared to receive paint. It is interesting that the label of every can of paint you buy begins with a couple paragraphs about surface preparation. It is also pretty amazing how often this information is disregarded or even ignored. The ideal ground for paint is one that is hard, smooth, dry and clean. The closer your surface is to this ideal the longer it will last and better it will look. Anything like dirt, grease, oxidation, or flaking prevents paint from sticking properly. Think of it this way, you would never wax a dirty car. It just makes sense to have the groundwork in good shape if you expect to get a long life from your paint. 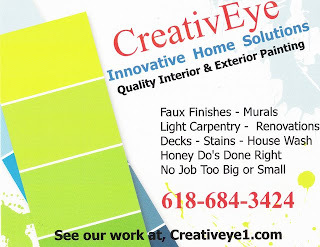 At CreativEye we want to provide the best possible product to our customers, if it is straight paint work or murals. We always guarantee professional quality preparation of surfaces. These are the steps we apply to all of our work. Surface Prep: Exterior: We low pressure house wash for the removal of dirt and grime. We remove and treat for mold and mildew and prime surface. Surface Prep: Interior: We wash down walls to remove grime, dust and grease that may effect adhesion of the paint. Scrape and Sand: We remove loose paint surfaces, sand and even out blemishes. Make ready for professional finish. Patch and Fill: We patch and fill all cracks and cavities in plasterwork or surface. Sand them to an even transition and coat with a primer. Professional Application and Paint: We use only quality professional products, which help us guarantee our craftsmanship. We prep, prime and topcoat surfaces giving superior coverage and life. Protect Surroundings: We cover floors, furnishings, plants, etc, making sure that nothing is the target of an unfortunate accident. We keep in mind that this is your home and treat it as polite guests, making as little disruption as possible. We work with your schedule and we work for you. Color and finish consultation. We are happy to come to your home or business and recommend colors that will harmonize with your fabric, tile, flooring and carpet. We assist you in those choices and give our expert advice on finish and application, a great solution for do-it-yourselfers. 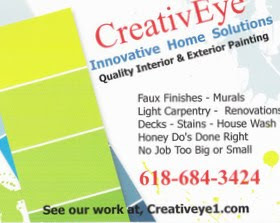 If it's one room or a whole house, a fresh new look for the living room or a full exterior painting job, no job is too big or small for CreativEye. If you’re not getting this kind of service: Then it might be time to give us a call at CreativEye.